on of civilizations from many different planets, galaxies and universes working together for the harmonious existence of all life. There is a galactic federation in each of the inhabited galaxies of our universe. These federations are part of the universal management structure much like field offices are part of the management structure for a large corporation. The Galactic Federation for the Milkyway Galaxy is called the Galactic Federation of Worlds, but some of the races represented in our GF may call it by other names, hence the difference in the names given by the Zetas, Andromedans, etc. Each race, civilization, and planet has a council within the GF to represent them. These councils vary in size depending on population as well as the amount responsibilities they carry within the management structure of the GF. There are literally thousands of these councils since there that many races represented. The GF is much larger than we may imagine. The GF has one major overseeing council which has representatives from each member council. This council meets in the Great Hall. But each council has its own Great Hall. Perhaps this is why there is so much confusion around this Great Hall business. Many channelers attend meetings in the Great Hall and think there is only one, when in fact, it could be the Great Hall of one of the member races or civilizations. You see how quickly it gets all complicated. The GF for our Milky Way galaxy is located in the Sirius star system. Our sun is a stargate to that system, and the GF. That is why the dog star Sirius is so important to Earth and plays a significant role in our history. The Milky Galaxy Galactic Federation is the oldest GF in this Universe. It was established at the end of the first Great Galactic War that was fought in the Lyra Constellation between the Humans, Reptilians, Felines and Carians. After this war, the survivors decided that they must establish some way to arbitrate disputes so that this kind of destruction (destruction of the Humans’ homeworld Avyon, the First Earth) would not occur again. Thus, the GF was established with the founding members being Lyran and Orion. Their first flagship was Pelegai, one of the few ships intact after the war. This was a very painful time and the wounds of this war would take many dimensions of time to heal. In the beginning, the GF was very small since so few had survived the war. The Lyran Council and Orion Councils doubled as the administrative arm of their new fledgling federation. In other words, they were the GF. In time new races were created as offshoots of the original four and the GF welcomed them as they reached galactic status, as we are about to do now. So the Galactic Federation grew and became a very large and powerful federation of worlds devoted to universal peace and prosperity. Now there are millions of members from across our galaxy. 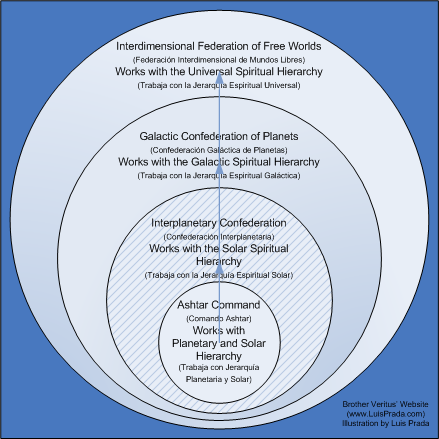 The Galactic Federation and their role in human evolution. You need to be a member of Galactic Federation of Light to add comments! Galactic federation of light is a fat hoax of all negative and darkness. hi galactic federation of light i have a question for you, you typed this in your story - - (Nibiru is not a planet with one civilization, instead it is a GF starship with representatives from many races) ive been worryed for a while now as there are countless videos and written text on the internet stateing that plannet x, nebru will come close to us on 21/12/2012 causeing tidal waves, earth quakes, volcanic eruptions, and posible cataclismic events that will wipe us out !. and videos showing a man made bunker in iceland that aparently has genetic samples and grains of every sort and 1 book of every title in preperation for this doomsday scenario, and that the d,um,s deap underground bases they have built all over this plannet aparently and for what reason?. so in short am i to believe the end is near or can anyone tell me otherwise as many so called spiritual folks on the net have also stated that the earth needs to renew and go through a clearing cycle which most probibly means wipeing us off the plannet to start from scratch- to say this is worrying me is a understatment and your above statment is conterarry to these other peoples claims could you shed some light on this for me please .